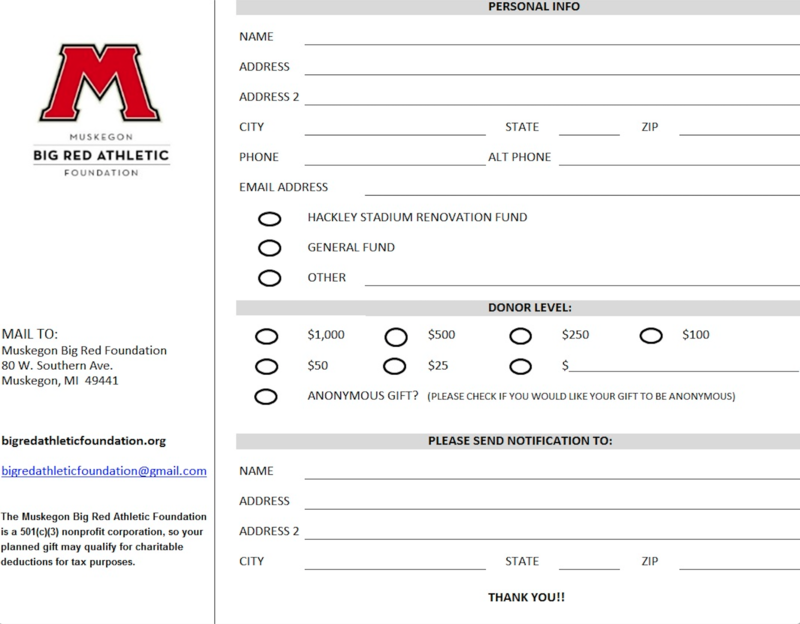 The Muskegon Big Red Athletic Foundation gladly accepts donations online via PayPal. Tomake a donation online, please click the button below. Please include your name, address and phone number and/or e-mail so we can pass along a card noting your donation for tax purposes. Special Thanks to the parents, alumni and fans of Muskegon High School and the school's athletic teams for supporting us throughout the years! Scoreboard Fundraiser -- Details To Come Fall of 2014!! Souvenir and sports apparel sales again this year in the booth located in Hackley Stadium during football games. Beneficiary designations on retirement plans, life insurance, etc. The Muskegon Big Red Athletic Foundation is a 501(c)(3) nonprofit corporation, so your planned gift may qualify for charitable deductions for tax purposes. Consult your tax professional for further information about the tax consequences of planned giving. If you wish to discuss planned giving further, please contact us at bigredathleticfoundation@gmail.com. Food, Gift Cards, Tickets, Etc.